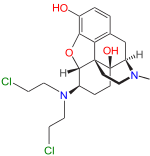 Chloroxymorphamine is an opioid and a derivative of oxymorphone which binds irreversibly as an agonist to the mu-opioid receptor. ↑ Caruso, Thomas P.; Takemori, AE; Larson, DL; Portoghese, PS (1979). "Chloroxymorphamine, and opioid receptor site-directed alkylating agent having narcotic agonist activity". Science. 204 (4390): 316–8. Bibcode:1979Sci...204..316C. doi:10.1126/science.86208. PMID 86208.